1 of 3 In a medium pot, cook wheat berries according to package directions. Drain and cool. Place 1 cup of cooked wheat berries in a resealable container for Tuesday. 2 of 3 Heat oven to 425 degrees . In a bowl, whisk together oil, vinegar, mustard, oregano and 1/8 tsp each of the salt and pepper. Pour 1/3 cup of the dressing into a large bowl. Toss with remaining cooked wheat berries (about 3 cups), tomatoes, olives, basil, bocconcini, 1/2 tsp of the salt and 1/8 tsp of the pepper. Set aside. 3 of 3 Meanwhile, place chicken breast halves on a baking sheet and season under skin with remaining 1/4 tsp salt and remaining 1/8 tsp pepper. Brush chicken with remaining dressing (about 2 tbsp). Bake at 425 degrees for 30 minutes, until internal temperature reaches 160 degrees . Let rest 5 minutes. Slice 2 of the chicken breast halves. Refrigerate remaining chicken. 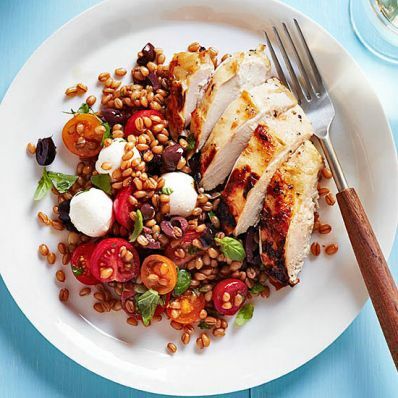 Divide chicken among 4 plates and serve with wheat berry salad. Per Serving: 660 mg sodium, 37 g pro., 7 g fiber, 41 g carb., 3 g sat. fat, 77 mg chol., 18 g Fat, total, 482 kcal cal.